Editor’s note: News of the BioFishency raise appeared in AgFunder, Aquaculture Directory, Calcalist, the Chinese media (中文), Globes, and Yahoo! Finance. BioFishency announced that it has completed an investment round of $2.4 million. The primary investors in the round were a private investor from China, Aqua-Spark, a global investment fund based in the Netherlands, and The Trendlines Group. BioFishency is an aquaculture solutions provider focused on dramatically increasing growers’ productivity and sustainability through its innovative technologies and extensive knowhow. BioFishency develops and produces cost-effective, easy-to-use water treatment systems for use in land-based aquaculture. The Company sells its SPB Single Pass BioFilters (SPB) in various capacities as a plug-and-play, complete systems, and manages turn-key projects. BioFishency’s systems operate effectively in countries around the world, including Israel, Congo, Bangladesh, India, Indonesia, and China. There is strong interest for additional units in Nigeria and Vietnam (for the shrimp market). With over $1.3 million in sales for 2018, BioFishency has more than doubled its total 2017 revenues. The Company continues negotiations with potential customers around the world, including for a number of large projects in China. Aquaculture, the farming of aquatic organisms, is the fastest-growing sector in animal protein production, with a market value of $13.3 billion. By 2030, 62% of food fish will come from aquaculture. * Yet, new technologies are needed to meet increased production demands. BioFishency’s technology has demonstrated a 95% reduction in water use for intensive tanks, a two- to fivefold increase in yields for extensive ponds, 2x greater nitrification (ammonia removal) for improved water quality, significant increase in yield per water and land use. * Aquaculture Boom Creates $133 Billion Water Treatment Market in 2030, Lux Research, March 2015. This BioFishency installation is part of the China-Israel Agriculture and Technology Town, in Shijiazhuang, China. 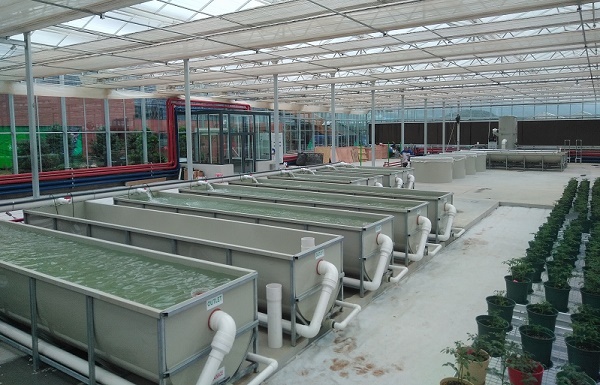 The BioFishency systems will be used to hatch and grow ornamental koi and Chinese perch. Stay up to date with news about Trendlines and our portfolio companies. © 2019 The Trendlines Group. All rights reserved. © 2019 The Trendlines Group.